The top-right corner of the QDS user interface (UI) contains a feedback icon . Clicking the Feedback icon displays the QDS UI feedback dialog as shown below. You can click the Feedback button from any screen. Enter your feedback in the textbox provided and click Send Feedback. 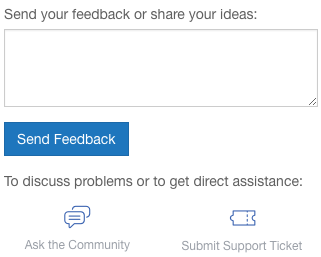 You can also directly access the Community posts or submit a support ticket using the Ask the Community or Submit Support Ticket icons below the textbox.